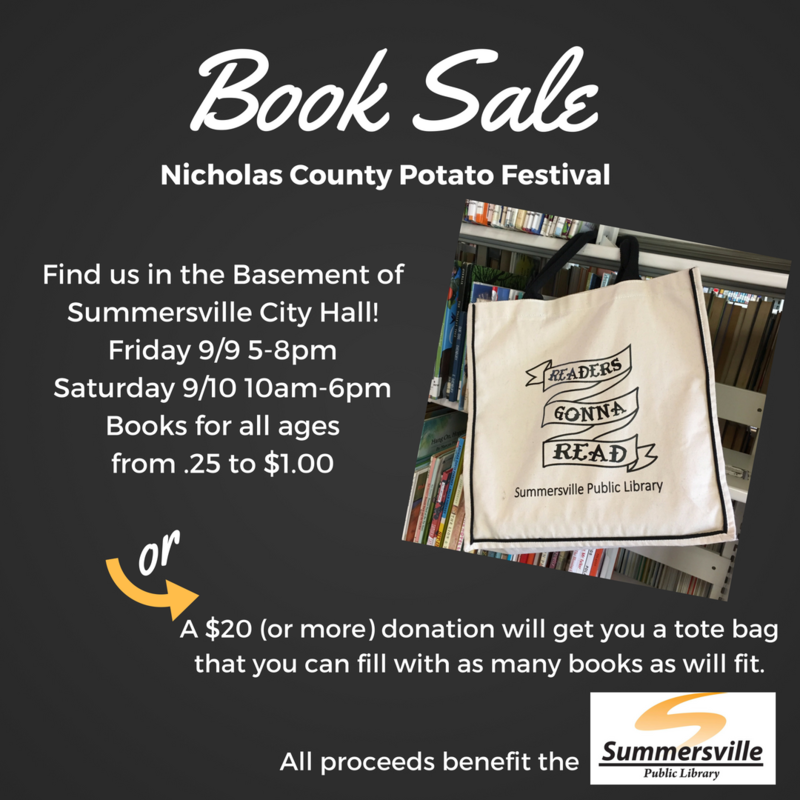 BIG Book Sale September 9-10 at the Potato Festival! 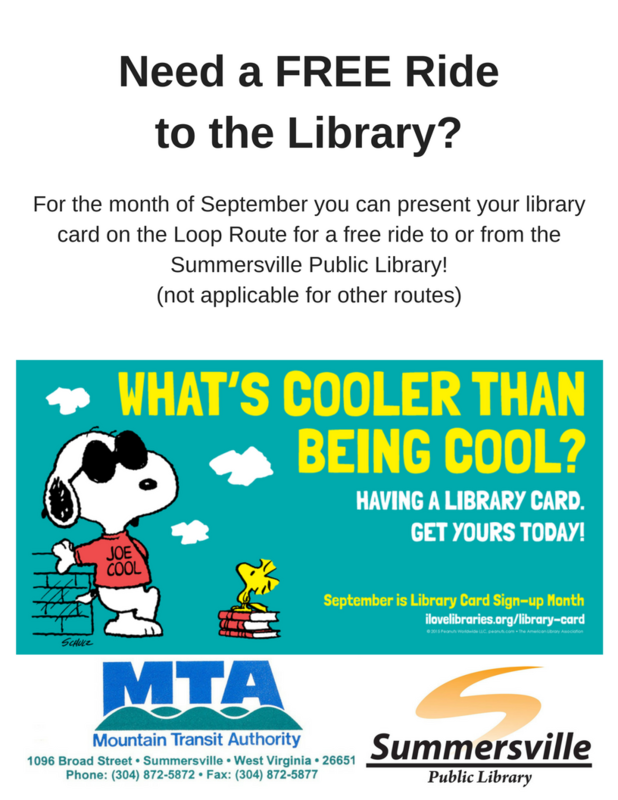 This summer we held our first Adult Summer Reading Program. It was a Bingo game. We had some wonderful prizes donated including an oil change from Mid-State Ford and a gift certificate for Maloney's. The grand prize for a blackout card goes to Christina Boyce, a $50 gift card for Amazon! All participants received a $5 gift certificate for our Potato Festival book sale. Thanks to everyone who participated, we look forward to offering the contest again next summer. Do you have a child who participated in our summer programs? Please take a moment and help us evaluate our programs with this brief survey. Thank you for your time. The Annual Book Sale is back at the Nicholas County Potato Festival (September 9-10) again this year. Shopping hours are Friday 5-8pm and Saturday from 9 am-6 pm. The sale will be held in the basement of Summersville City Hall. All proceeds go to purchase new books for the library. We are looking for additional volunteers to help with set up and clean up as well as sale hours. If you are interested in helping please call 304-872-0844. 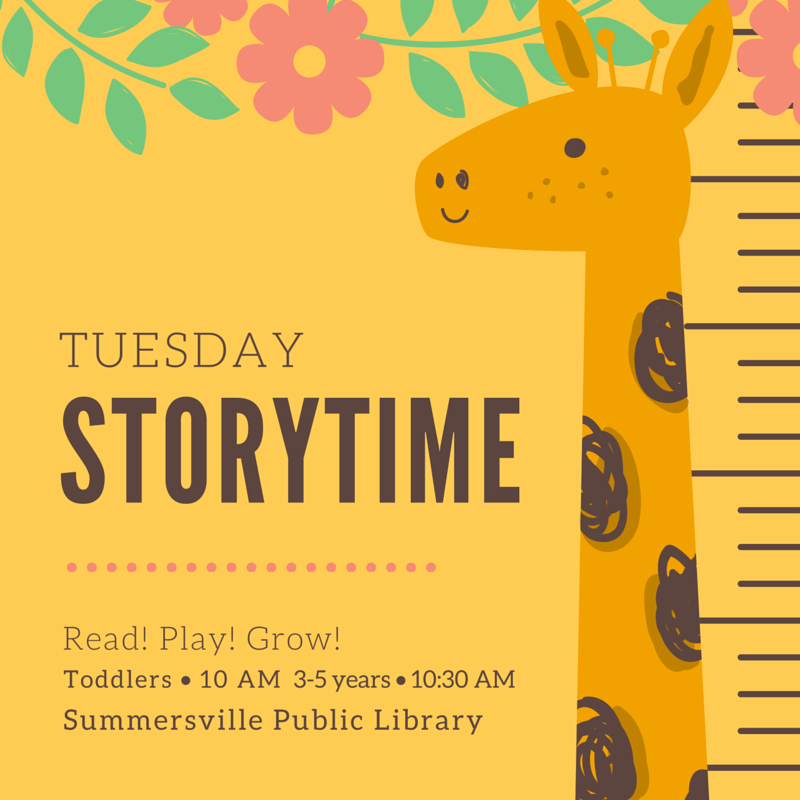 Storytime and Early Explorers return September 13th! 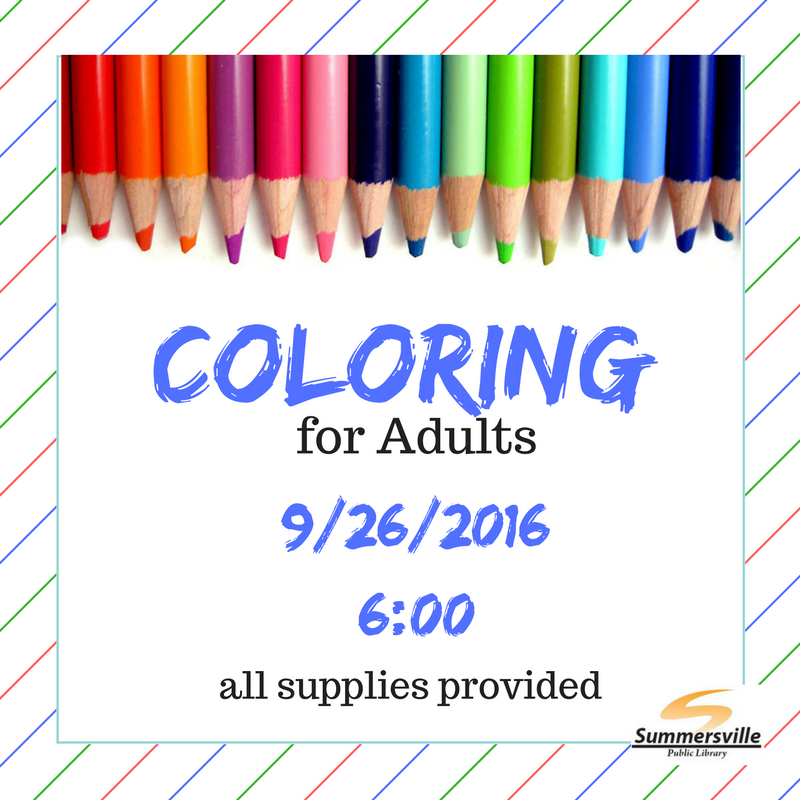 Adult only coloring returns in September! Sit, relax and color your stress away. LEGO Club! September 28th 4-6pm. 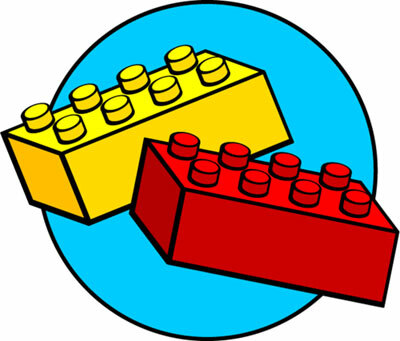 LEGO Club is an open house, drop by anytime, stay as long as you can. 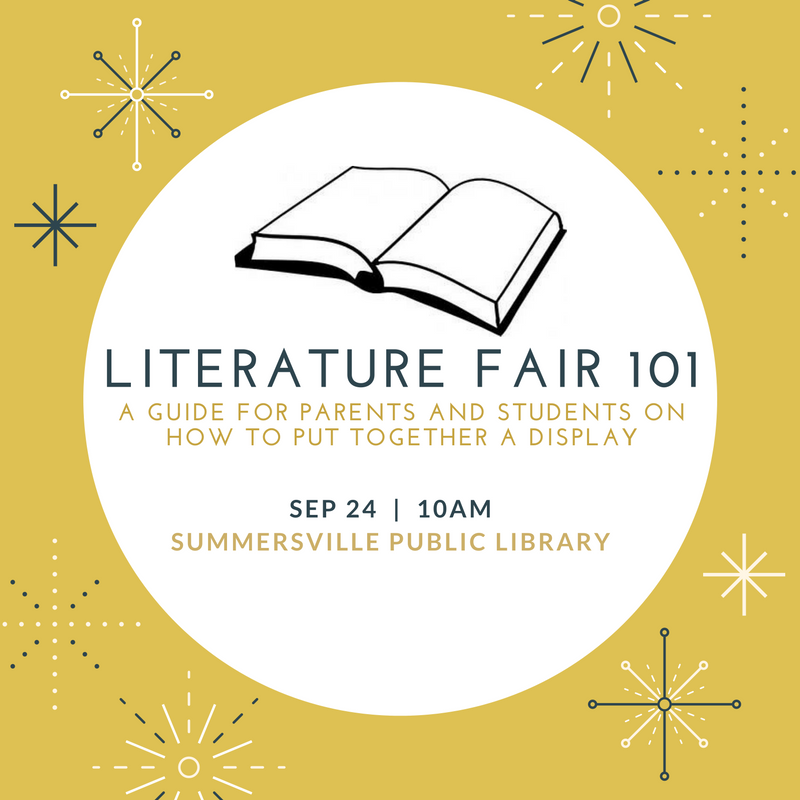 Get the inside scoop on how to put together a literature fair display, plenty of time for questions too. New Books! So many new Historical Fiction books to choose from in September.